Britain won three medals on the opening day of the European Short-Course Championships in Denmark. Siobhan-Marie O'Connor, 18, and Sophie Allen, 21, claimed silver and bronze in the 200m individual medley. 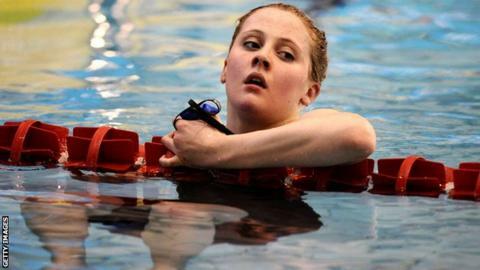 Jemma Lowe, 23 took bronze in the 200m butterfly as Spain's Mireia Belmonte Garcia set a new European record. Michael Jamieson set a British record to qualify for the 100m breaststroke final, while Fran Halsall progressed to the 100m freestyle final. The short-course championships are held in a 25m pool as opposed to the 50m used in long-course events. O'Connor, who competed in the 100m breaststroke at London 2012, could not threaten long-course world champion Katinka Hosszu. The Hungarian set a championship record to take gold in 2:04.33 ahead of O'Connor in 2:06.73 and Allen in 2:06.86. Lowe finished sixth in the 200m butterfly final at London 2012, but a brave swim in which she visibly tired saw her clock 2:04.51, as Belmonte Garcia set her new European mark of 2:01.52. Jamieson, 25 - who is coming back from a recent heart scare - swam a time of 57.89 to lower the British record set by James Gibson (57.91) in 2008 and qualify fifth fastest for Thursday's 100m breaststroke final. World Championships medallist Halsall, 23, qualified fastest for Friday's 100m Freestyle final by leading from the gun to win in 52.32. Plymouth-based Ruta Meilutyte looked on course for victory in the 50m breaststroke, but finished second by six hundredths of a second as Russia's Yuliya Efimova took the title.